TTD TIRUMALA DARSHAN TICKETS ONLINE QUOTA:: Tirumala Tirupathi Devasthanam is one of the famous, oldest and richest temples in southern India and it will open throughout the year. Every day more than 1,00,000 pilgrims visit the Sri Venkateswara swamy Temple, Tirumala for darshan. 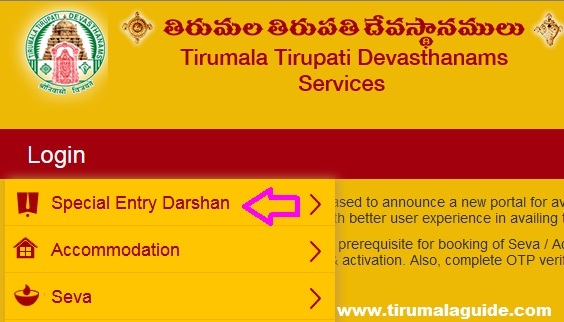 To reduce the waiting time in queue lines Tirumala Tirupati Devasthanams (TTD) introduces e-darshan facility where in the pilgrim is provided with Segra darshan slot remotely before actually the pilgrim reach tirumala. Along with the 300rs special darshan tickets, pilgrims can book the rooms for accommodation and special seva tickets through the TTD official online website (www.ttdsevaonline.com). For special entry darshan tickets or rooms booking pilgrims need to register as a pilgrimages or a donor. Every day nearly 13,000 thousands are available in portal for booking online. TTD Tirumala authorities had implemented to raise the online quota of darshan tickets to accommodate more no. of pilgrims. Addressing to the media. The E.O of TTD had said that with an aim to provide hassle free and comfortable darshan to pilgrims. TTD had bought up some amendments in the existing on-line booking system of special darshan. Special entry booking can extend up to one day in advance up to 12mid night. The online quota of Rs.300 ticket is extended up to 26000. And Rs.50 tickets are increased up to 4000 per day. The darshan for both this categories is provided from 9am to 9 pm every day in different slots. The below is the timings for and online ticket quota details about special entry and sudarshanam tickets.